Updated 2017 weekday ridership numbers show an average of 612,652 linked trips a day across the entire Metrorail system last year, the fewest since 2000. WASHINGTON — Metrorail weekday ridership has failed to significantly rebound from the additional declines it faced last year, and weekend ridership has cratered in Northern Virginia, new data provided to the Northern Virginia Transportation Commission (NVTC) show. Updated 2017 weekday ridership numbers show an average of 612,652 linked trips across the entire Metrorail system last year, the fewest since 2000. A linked trip is what most riders would consider one trip from destination to destination. An unlinked trip is what federal databases use, counting each time a rider boards a train as a single trip, meaning a transfer between lines would be counted as two separate trips. At Virginia stations, weekday unlinked trips increased 0.7 percent in February 2018 compared with February 2017, but that’s barely a dent in the drop from the previous year. The paltry 0.7 percent rebound of unlinked trips in Northern Virginia could be even less impressive, since the Blue Line was shut down between Rosslyn and the Pentagon for more than half of February 2017. The 2017 unlinked trips were down 11.5 percent over February 2016. Metro has blamed the declines partly on service and reliability concerns such as single-tracking, but also partly on gas prices and other options such as Uber or Lyft. The declines in ridership emphasizes the challenges Metro faces to win riders back even as the agency must continue significant track work to maintain the system. 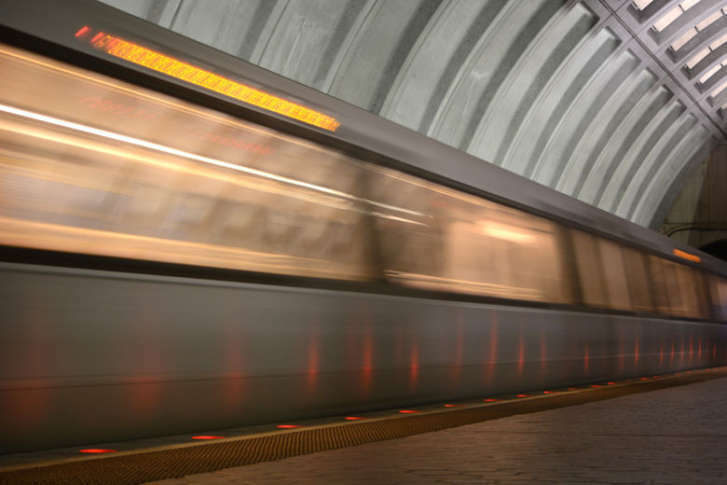 Metro leaders have said rush-hour ridership has stabilized after the sharp declines during round-the-clock track work, but data show weekday ridership is not recovering toward previous levels. In 2016, Metro counted an average of 639,101 linked weekday trips. In 2015, it was 712,843. The peak was from about 2008 to 2012, when the transit agency averaged at or just below 750,000 trips each weekday. The data provided to the NVTC show the weekend ridership trend is even worse: down 10.2 percent on Saturdays in Virginia compared to 2017 after a 9.9 percent drop the previous year, and down 8.9 percent on Sundays after an 11 percent drop the previous year. Metro’s new $2 charge for parking on Saturdays at all lots except Wiehle-Reston East, and the additional “non-rider” fees for people who pay to exit with credit cards or a SmarTrip card not just used to ride the rail system, do not appear to have immediately deterred a significant number of Saturday riders, the numbers provided to the NVTC suggest. Metro started the pilot in February, and parking lot usage on the three Saturdays that month where fees were charged was essentially the same as the average over the preceding six months, Metro’s data show. At Huntington, West Falls Church, Dunn Loring, Vienna, Franconia-Springfield, Van Dorn Street and East Falls Church, the percentages of parking spaces available on Saturdays in February matched the numbers since July 1. On average, excluding Wiehele-Reston East, 15 percent of Metro parking spots are filled on Saturdays in Northern Virginia. On weekdays, about 68 percent of the spots are full. Only Van Dorn Street and East Falls Church are consistently overflowing on weekdays. The garage at Wiehle-Reston East averages about 90 percent full. The large garage at Franconia-Springfield has the highest proportion of available spaces and averages 55 percent full since July 1. In February, the Franconia-Springfield parking facility usage dropped to 51 percent, when expanded non-rider parking fees kicked in that apply to VRE riders among others. Useage had been 71 percent two years earlier. Metrobus ridership is also down significantly in Northern Virginia, 10.3 percent overall and 9.1 percent on weekdays, but that includes some “lost” ridership that was actually transferred to some local bus services when Metro cut back its own operations on some significant routes. Metro is in the midst of planning a major overhaul of bus routes across the region that could eliminate some and completely redesign others. MetroAccess paratransit trips increased 1.2 percent in Virginia in February 2018 compared with 2017, to 26,932 trips.